Sharks are facing annihilation simply to fulfill people’s desire for shark’s fin soup. Over 70 million sharks are caught and ‘finned’ each year then tossed back alive into the sea to die. Hong Kong consumes half of the world’s total of shark’s fin soup. To change consumers’ minds about shark finning and consuming shark’s fin soup by pointing out that their desires were directly responsible for the slaughter. 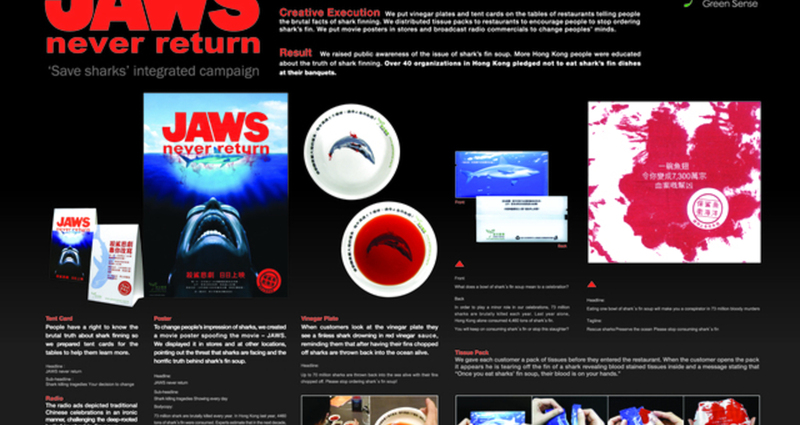 The challenge was how to confront shark’s fin consumers with their responsibility. Instead of using traditional media, we went directly to restaurants where consumers were ordering sharks’ fin. We placed vinegar dipping dishes and tent cards on the tables, illustrating the brutal facts of shark finning. We distributed blood-stained tissue packs to customers outside the restaurant reminding them that the shark’s blood was on their hands. We put adapted JAWS movie posters in stores, broadcast radio commercials and challenged the traditional Chinese custom of enjoying shark’s fin at banquets and celebrations.